Corfe Bears > Charlie Bears > SHELBY 15"
Shelby is a delicate looking panda, made with soft aqua fur on her arms, legs and ears, while her tummy and head are mink. She has aqua shading around the eye, which makes her a panda and her mink hand-stitched nose has some shading on the top. The paw pads are unusual, as they are made from 2 different materials and one of these also lines the inner ears. 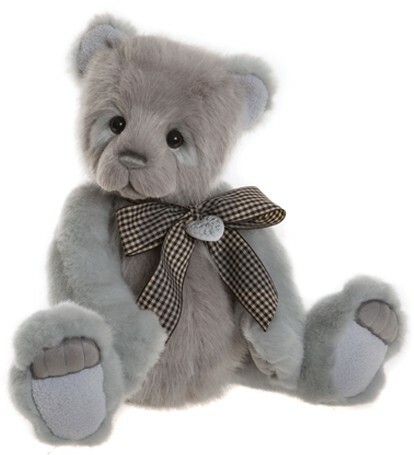 This sweet bear has lots of charm and she wears a checked ribbon, secured with an embellished heart. Shelby is from the Charlie Bears 2019 Collection.